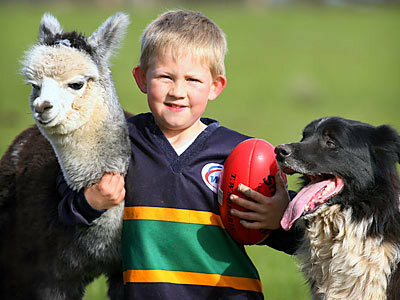 Little Rory Matthews doesn’t have any brothers or sisters to play footy with – so he trains with an alpaca, a dog, a pig and a cockatoo. the whole story’s at the australian daily telegraph. the pictures are unreal! >Oh “Chicky” the alpaca is too cute! >That is one determined alpaca. I think they should send Chicky to the Under-9’s instead of the boy.